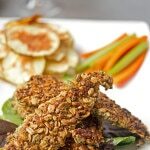 Healthy and delicious oven baked chicken tenders crusted with oats, hemp hearts, pumpkin and sesame seeds, flax, and chia. In the first bowl add the flour. In the second bowl add the egg and beat with 1 tbsp water. In the last bowl add the rest of the ingredient. Cut each chicken breast in 3 long strips. Then dip each strip in flour, then the egg wash and last in crumbs coat completely. Repeat till all the chicken is coated. Melt coconut oil in sauté pan on medium-high heat and add a bunch of the chicken strips and brown both sides of the strips, but don't over crowd the pan or the chicken will have a hard time browning. You might have do 2 batches or more. Throw all the browned chicken strips onto a baking tray and cook for 5 mins. Serve right away.